Rep. Tim Scott, the only SC Representative listed as supporting a ban on earmarks. It seems that the TEA Party movement has a considerable amount of work yet to do, even in conservative states like South Carolina. The Heritage Foundation has reported that only "72 Representatives have firmly stated to constituents that they will support a continuing ban on earmarks." 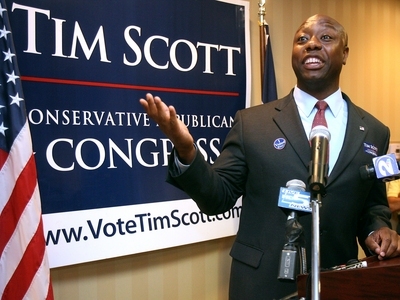 In South Carolina, only the principled Tim Scott is on the list. Do the others need reminding or have they already succumbed to the Washington Establishment culture? Don’t see your Representative here? Use this link to call and ask if he or she supports continuing the earmark ban.